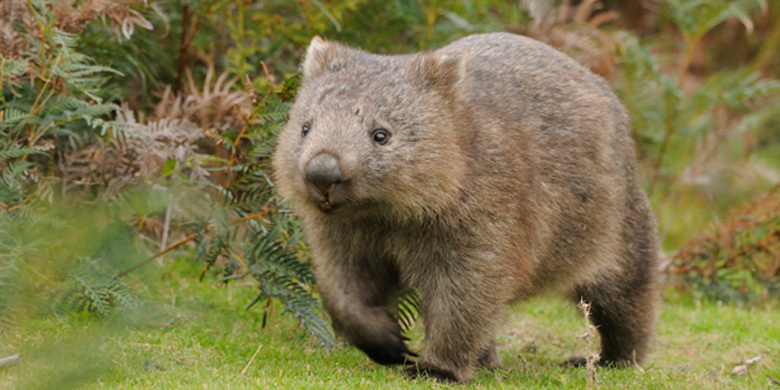 Today I want to write about a lumbering Australian animal, the common wombat. Also known as the coarse-haired wombat, these wonderful marsupials grow up to 1 metre long and can weight up to 26 kg. Common wombats are nocturnal, coming out at night to graze on grass. They have very sharp teeth that never stop growing throughout their lives, so they have to eat food that will help to keep their teeth from growing through their skin. After eating, they have the longest digestive process out of all mammals (about two weeks), which results in very dry poo in the shape of a cube. They are excellent diggers, using their powerful and sharp claws to dig large burrows. They have very hard bum that they use to protect themselves in their burrow when being attacked by foxes or other predators, often crushing their attackers to death against the walls of their burrows. At breeding time, both male and female common wombats are very aggressive with each other before mating. The baby wombat is raised in the mum’s pouch, which faces backwards so that it doesn’t get dirt in it while she is digging. Common wombats are found in cool and wet forests in south-eastern Australia, including Tasmania, and can even survive in alpine areas. Are there any other interesting facts that you would like to share about common wombats?